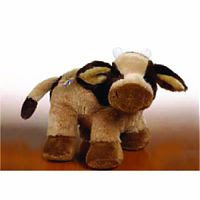 This New Webkinz Brown Cow is HERE and just arrived. You know cows are producers of the milk that we drink so they are very exciting animals. This cow is friendly and loves hanging out at kinz academy. This webkinz is looking to come home with a family and is looking forward to sharing the love. This little one has arrived in December 2008. Adopt today. Does it have a code?